Developed specifically for use with high-stakes, public safety and protective services personnel, the 16pf Protective Services Report Plus (16pf PSR+™) is research-based and job-relevant. A quick screen for the pathology factors that could derail individuals in public safety and security positions. 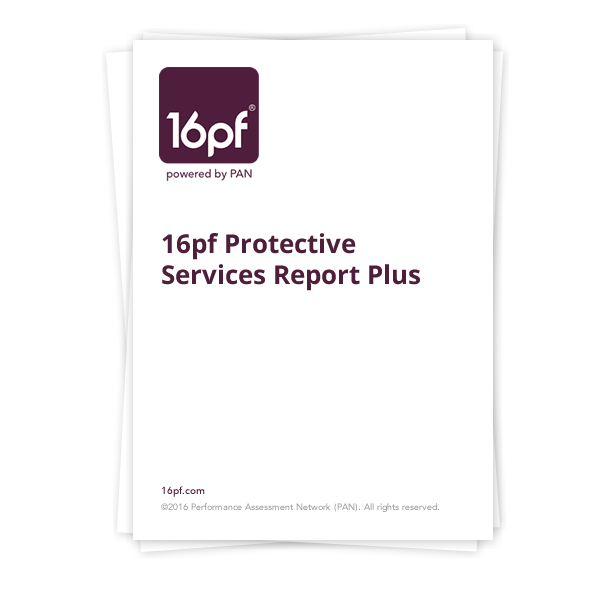 The 16pf PSR+ is generated from the 16pf Psychological Evaluation Questionnaire (16pf PEQ) which is a combination of 140 clinical items and the 16pf Questionnaire. The report includes the same in-depth normal personality information as the 16pf Protective Services Report (16pf PSR) that is used in pre-offer selection plus additional narrative insights into the individual’s thought patterns, beliefs, and behavior. The report also provides guidance on how the elevated clinical scales may affect a candidate’s job performance and thus warrant further evaluation. This information is supplemented by a score profile of the twelve clinical scales, plus a QuickEval Index and three composite indices that signal whether further exploration may be needed in the areas of depression, distorted thoughts, and risk-taking.